I learned a very important lesson during my time in undergrad: finding a school that is the right “fit” is a key component to academic success and overall happiness. During the course of applying to law schools, it’s easy to fall into the same traps prevalent in the search-and-apply mission of the undergrad process. The allure of the “best” or most highly ranked schools is hard to ignore. Plus, who doesn’t want to be a student at one of the best universities? But these traps have been perpetrated by published reports from the US News & World Report and Princeton Review. Like many reports, formulas have been created, things have been quantified and studied, and variables have been accounted for. In this instance, the purpose has been to discover the “best” schools. The attributes that separate the “best” schools from the rest may vary, with some overlap. There is usually a mixture of objective and subjective factors that are studied to provide a formula for what constitutes a good school. But when it comes to making an important decision such as which school to attend, it is critical to consider a variety of factors using more than one source to guide you. My advice is to do your own research of the reports mentioned previously, but don’t make any decisions solely based on them. If you know what you want to study, give preference to schools that focus time, energy, and money into that program. If you aren’t sure exactly what you would like to focus on, give priority to other factors such as location, employment rate upon graduation, and cost — or whatever other attributes that are important to you. pick up a school newspaper. The newspaper will provide information on the focus of the school and student body. It can also give insight into the safety of the campus. 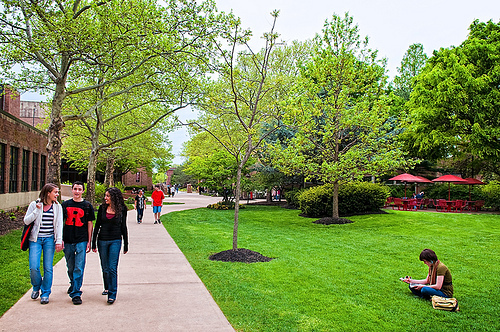 Visiting a campus helps you to gather information first hand and provides you with a “feel” for the school that you can’t get by reading about it — a feeling, something intangible. I cannot overstate the importance of this. Believe me, I have visited a lot of college campuses. And I’ve been excited about schools only to walk away from a visit hugely disappointed. But I’ve also had the fortune of feeling so-so about a school only to be surprised at my experience there. This was what happened at the campus I mentioned in the last post. I know this because I started my undergraduate studies at a small, private, religiously affiliated university only to transfer to a large, public university for my last two years. For me, finding and attending a school that was “the right fit” made all the difference. Check back next week to read my personal story!